Fix the error 32777 “Unable to establish connection with the activation server” Windows Xp. Usually this error has nothing to do with internet connection itself. 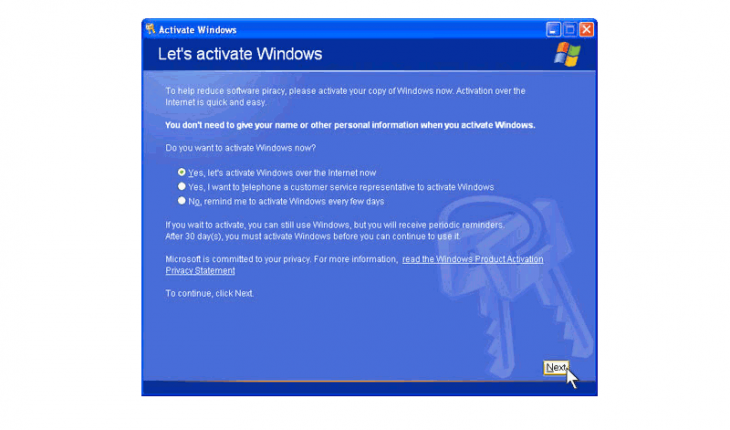 You can browse the internet just fine, but when activating Windows Xp it tells you can’t connect to activation server. So, here is the list most of common solutions fixing this problem. This is one of the most common solution for error 32777. Make sure your computer date and time are correct. Correct your system date, restart and try activating again. In case you don’t have administrator permissions you may change the date in BIOS or in safe mode. If this step therefore does not resolve the issue or your system’s time is correct, continue to next step. This step is far more time consuming. Because Windows Xp activation service relies on Internet Explorer, it should update to latest supported version, which is 8. After the install restart you computer and try activating again. If it still does not help try installing the latest service pack SP 3 on your machine. Now select “Safety” and then “Windows Update“. On the left menu select “Express” option. Wait for the updates to process. Now click “Review and install updates“. Now restart your computer and try again. Now select “Tools” and then “Internet Options“. Find and uncheck “Check for publisher’s certificate revocation” option. Also find and uncheck”Check for server certificate revocation (requires restart)” option. Then click “Apply“ and “Ok“. Last resort would be activating your system using telephone method. Just click the “Telephone” button in the Activate Windows Wizard. Then you will need make a call to Microsoft. Found another way to solve the error 32777, unable to establish connection with the activation server problem? Leave a comment below. I was 32777 message and i install XP SP3 service pack and after succes activation. Who cares about some activation? Just crack it! When calling the activation center, just keep a single word in mind on the first question. When the automated assistant asks how many computers has this copy of Windows has been on, the magical answer is ‘one’. As long as one says that & follows the prompts, the chance of successful activation rises to 98%. Of course there’s exceptions where this won’t work, like using (example) a Dell COA to activate a HP computer. This warning usually presents itself before a phone call. Be careful & most of the time your legit copy of Windows will be activated in 2-3 minutes.